We have talked about new Office document exploits that don’t require macros to run. Here is a new one with more twists and turns than a mountain road. Trustwave has reported instances of a new attack that starts as a spam or phishing email with a Word document (.DOCX) attachment. Open the Word document and it will call out for another document download, this one in Rich Text Format (RTF) that takes advantage of known vulnerability CVE-2017-11882. This document downloads an HTML document (HTA), that spawns Powershell with a Visual Basic script (VBS), which finally downloads a keylogger in PHP. If all this has your head spinning, it is having a similar effect on the anti-malware software we rely on to protect us from these sorts of attacks. Here’s the path again in a simple flowchart. 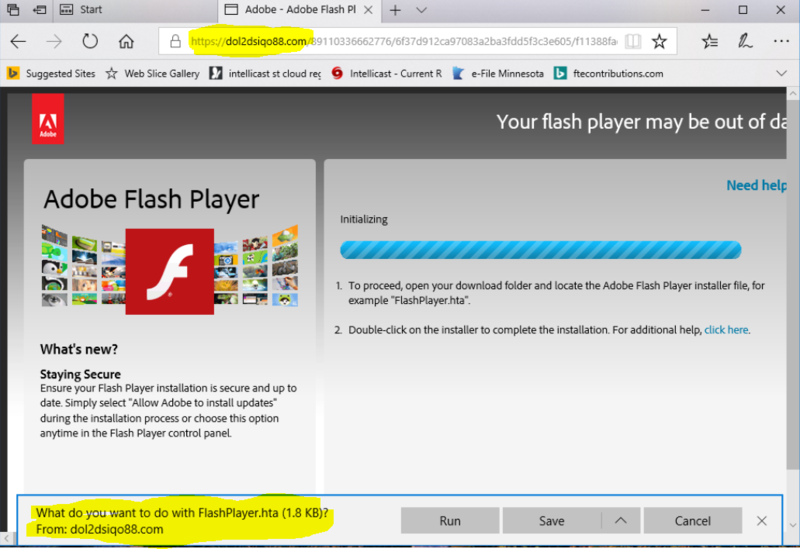 I removed a bit of malware from a client system recently, and it had spawned a browser page that looked a lot like and Adobe Flash Player update. See the following image. Notice the attempted download of the HTA file, and the obviously wrong web address in the browser address bar. You will need to be on the lookout for pages like this one. Running the HTA file would have installed the keylogger. A keylogger is a malware program that captures your keystrokes as you type, and is used for collecting user names, passwords, credit card number, social security numbers, and other personal information. I encourage you to check out the Trustwave article for more examples and images.